We have a small kennel of boxers located just north of New Orleans in Mandeville, Louisiana. 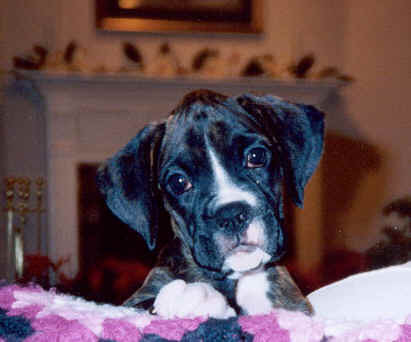 Our addiction began with the purchase of our first boxer puppy, Harlie, a flashy fawn female. As anyone that is owned by a boxer would know, it's impossible to have just one. So we began our search for a second puppy. After nearly a year of looking at many litters we decided to breed Harlie. She was bred to Ch Hi-Tech Albert of Ironbark, a gorgeous flashy brindle male. Harlie whelped seven beautiful and healthy pups, three of which we could not part with. Soon after, I met and became friends with other boxer enthusiasts and joined the Boxer Club of Louisiana and served as secretary for three consecutive years. We are active in conformation and have posted several win pictures as well as pedigrees of each of our boxers for you to view. Thanks for visiting our site and our boxers. Take a few minutes to look around and drop us a line to let us know what you think of our website. We are updating constantly so come back soon! Robbie finished in grand style with a 5 point major at the Georgia Boxer Club Specialty. Many thanks to Judge Darryl Vice for a fantastic finale and to Aaron Wilkerson for the expert care and handling of our sweet boy! We have a new Miniature Pinscher champion! Thank you Marcia Tucker and Pam Ruggie (Sunsprite and Pevensey Miniature Pinschers) for sending us this wonderful little boy. He is a joy!! We have added a new Puppies page as well as a page for Available Boxers. There you will find information on puppies here at Wildhart as well as referrals to other reputable breeders that have puppies available at the present time. Be sure to visit the rest of our Boxer family before you go! Visit the rest of our boxers by clicking on their names. Please contact us to inquire on upcoming litters! Our links page will lead you to many informative articles as well as a list Boxer Breeders listed both alphabetically and by location. Thank you for stopping by our internet home. New and exciting things are always happening so please visit again soon! �1997-2010 Wildhart Boxers. All rights reserved.